Thank you for continuing visiting my blog even while I was away, especially for those of you who left the comments, your encouraging words really mean a lot to me! The trip was to visit my mother-in-law. She is over 70 and these days she frequently recalls her childhood. Her family didn't have money in the old days. Her dad, an Italian, used to make wine in the basement and grew vegetable and fruit in the yard. One dessert her dad always made to the children was home-grown apple slices dipped into home-made red wine. It isn't the type of dessert that would ever come across my mind, nor the type most kids would dream for. But in those days foods weren't abundant, so merely the scene of "having" something regardless what it's was already a blessing to her family. I see poached pear sprouting all over new cookbooks, it somehow connects me to my mother-in-law's red wine apple, although her "poor" version contrasts the sophisticated image of the pear projected from the cookbooks. Anyway, I am so blessed with living in Barcelona since fruits and red wine are always abundant, and inexpensive. There are many ideas of making it fancier or laboring into a gorgeous tart, I still go for the basic, as it has a completed story to tell, and an ultimate taste to deliver. To make the spice-infused red wine: bring 3/4 cup of sugar, 1/2 cup of water, a big cinnamon stick and three cloves to boil, then stir in 1 1/2 cups of your favorite red wine. Simmer for half an hour. To poach the pears: Select the pears which are ripe but firm, peal the skin, and cut into a half if they're big. Soak them in the spice-infused wine (all covered) overnight. Next day, bring the wine and the pears to boil, continue to simmer for 15 minutes or so, turn off the heat and let the pears sit for an hour if they aren't soft enough to you. Drain the wine before the pears get too soft. Really yummy! Nom nom nom! Very elegant, isn't that always true with whatever you make ! 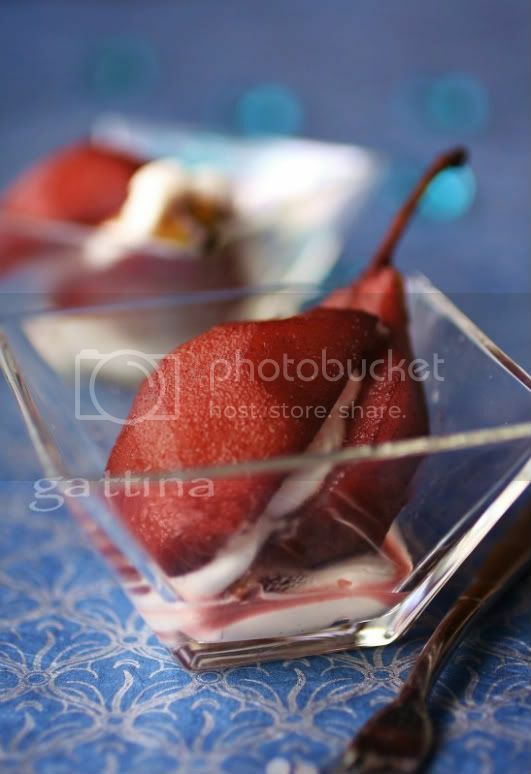 You are my very first inspiration to try my hand at food styling and photography. Your photos have a very natural, so not made up elegance to it. Thank you.